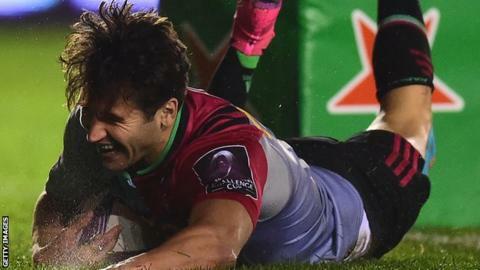 Harlequins began their Pool 3 Challenge Cup campaign with an impressive bonus-point victory over Montpellier. Benoit Paillaugue's four penalties put the French side in control early on. But two tries in nine minutes from Luke Wallace and Nick Easter saw Harlequins turn around a nine-point deficit and lead 15-12 at half-time. Jack Clifford and Danny Care scored tries after great driving mauls, while Ollie Lindsay-Haugue and Chris Robshaw also went over in the second half. Montpellier, whose coach Jake White has said he is interested in the vacant England job, led early on through three successive Paillaugue penalties. But the hosts were back in it when a great play from the lineout - after Evans had superbly landed a kick in the corner - saw Wallace sneak over from five metres out. Evans missed the conversion attempt but was successful after Easter nipped in to score to help the home side to a three-point lead at the break. A terrific driving maul saw Clifford go over and Evans added the conversion to score his 2,000th point for Harlequins. And Kyle Sinckler's clever deft touch set free Robshaw for Harlequins' sixth try to seal the victory. Harlequins: Brown; Yarde, Hopper, Sloan, Visser; Evans, Care (capt); Marler, Ward, Jones, Matthews, Twomey, Clifford, Wallace, Easter. Replacements: Buchanan, Lambert, Sinckler, Treadwell, Robshaw, Dickson, Botica, Lindsay-Hague. Montpellier: Mogg; Fall, Nagusa, Tuitavake, O'Connor; Trinh-Duc, Paillaugue; Nariashvili, Burden, Mas, Tchale-Watchou, Willemse, Ouedraogo (capt), Liebenberg, Qera. Replacements: Ivaldi, Cilliers, Van der Linde, Timani, Galletier, Lucas, Ebersohn, Malzieu.